U.S. stock futures pointed to a mildly lower open Monday as President Obama's budget projects a record deficit of $1.6 trillion. NEW YORK ( TheStreet) -- U.S. stock futures pointed to a mildly lower open Monday as President Obama's budget projects a record deficit of $1.6 trillion. 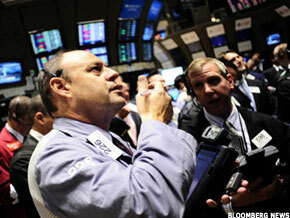 Futures for the Dow Jones Industrial Average were down by 3 points to 12,238. Futures for the S&P 500 were lower by 1.1 points to 1326.20, and Nasdaq futures were off by less than 1 point to 2327.75. Stocks rose Friday as President Hosni Mubarak resigned and home finance reform lifted shares across the financial sector. China surpassed Japan to become the world's second-largest economy after the U.S.
Overseas, the Hong Kong Stock Exchange jumped 1.3% and Japan's Nikkei gained 1.1%. London's FTSE was shedding 0.3% and the DAX in Frankfurt was down by 0.2%. President Obama is sending a $3.73 trillion budget to Congress that promises $1.1 trillion in deficit savings over the next 10 years through spending cuts and tax hikes. The new budget proposes a record deficit of $1.6 trillion. EchoStar ( SATS agreed to buy broadband satellite network provider Hughes Communications ( HUGH for roughly $2 billion, plus debt. Hughes shares were losing 2.9% at $60 ahead of Monday's opening bell. General Electric ( GE agreed to buy the well support unit of the U.K.'s John Wood Group for roughly $2.8 billion. GE's stock was gaining 0.4% at $21.42 in early trading. There are no economic releases scheduled for Monday's session. In commodity markets, the March crude oil contract was trading 4 cents lower at $85.54 a barrel. The April gold contract, the most actively traded gold future, was lower by $1.70 to trade at $1,358.70 an ounce. The benchmark 10-year Treasury fell 2/32, lifting the yield to 3.644%. The dollar strengthened against a basket of currencies with the dollar index up by 0.4%. --Written by Melinda Peer in New York.